We’re ready to start our twenty-second day of travel along historic US-6! Hello again, I’m Don Milne, your Roadtrip-'62 ™ guide. Yesterday, we traveled just 57 miles, from Davenport, Iowa to Iowa City, Iowa. It was our first day west of the Mississippi River, out on the prairie of the Great Plains. Today we’ll continue across this rural landscape as we get very close to the halfway point of our trip. Of course, there are more museums, architecture, good food, and history along the way. We’ll even have a chance to see what’s left of a rural farming “utopia” of the 1800s. If you see anything you like, get yourself out on the road and enjoy it in person. I’m having fun on this virtual roadtrip and I hope you are too. But there's nothing like the real thing! At any time, click on an underlined word below to learn more about the places on the trip. Let’s get back on the road again! I’m craving some donuts for breakfast today and found two good choices in Iowa City. They are members of old chain eateries, but neither of them were here in 1962. So, I guess I’ll have to flip a coin: what did folks here do for donuts in 1962? Heads, it’s Dunkin Donuts, which began in Quincy, Massachusetts in 1956 and did not expand this far west until just a couple of years ago. Tails, it’s Daylight Donuts, which began in Tulsa, Oklahoma in 1954 and might have just reached Iowa by 1962. Well, it’s tails so lets head over to Daylight Donuts; it’s only a half-mile off US-6. Yesterday, we stopped at the University of Iowa and the Old Capitol building, so today we will take a look at some other places that have been here since before 1962. Let’s start with the Johnson County Courthouse. The courthouse is an outstanding Romanesque style building, reminding me of the Wood County Courthouse we saw back in Bowling Green, Ohio. The courthouse here in Iowa City was completed in 1901 and was among the last of 7 buildings designed by the Chicago architectural firm of A.W. Rush, all on essentially the same design. The bulky tower, fortress-like turrets, and large ornamented arches are typical of the style, as is the rough-hewn stone of the exterior. One reason these were popular is that the entire interior space was useable. Even the turrets at the front and back of the building are not just decorative features; they were actually used for office space. Looks better than a corner office to me! If you’re here on a weekday, it’s a good idea to wander around the interior to see how it still works over a hundred years later. But even though the space still works, it’s no longer large enough and the county is considering an annex. To preserve the street views of the historic courthouse, the proposed annex is designed to be largely underground, utilizing the sloping landscape of the west side of the current site for entry and including include a pedestrian friendly green space roof. Another attraction that has been around for a century is the University of Iowa Museum of Natural History. The museum includes a Mammal Hall, with animals from almost every continent and from aardvark to zebra. But the must-see exhibit is the Laysan Island Cyclorama, opened in 1914. Laysan Island is a small atoll in the far northwest of the Hawaiian Islands that is home to huge colonies of sea birds. Between 1902 and 1914, university faculty members conducted three expeditions to the island, collecting most of the materials in 1911. The introduction of rabbits to the island in 1903 wreaked havoc on the native plant, insect, and bird life, making the expeditions and this resulting display scientifically important. You enter the cyclorama through a gorgeous, narrow, wood-paneled hall that offers a glimpse of the elegance of the period it was constructed in. Once inside the cyclorama, you are enveloped in a 360-degree panorama of Laysan Island. Since the time of the expeditions, the Laysan Rail, Laysan Honeycreeper, and Laysan Millerbird have become extinct. The Cyclorama is now one of the few places in the world where you can view mounted specimens of these birds. Fortunately, over the past century, the rabbits have been extirpated from Laysan and some native species have begun to recover. The exhibit is as close to authentic as you can get because university staff brought back sand and rocks from Laysan, forming the base of the exhibit. This is enhanced by the background mural, which was painted by Charles Corwin, a member of the 1911 expedition. We could also stop at the University of Iowa Museum of Art, but they are undergoing repairs due to the flood of 2008. While the former building was deemed unsuitable for return of the art collection, the art was saved. It has temporarily been dispersed to four temporary facilities, including the Iowa Memorial Union building here and the Figge Art Museum back in Davenport, Iowa. Another site we that will not visit is just too new for our trip; the Mormon Handcart Site dedicated in 2001. Iowa City was the outfitting location for Latter-day Saints heading west between 1856 and 1857. Many converts emigrated from Liverpool, England to the United States at this time. After arriving in Iowa City, nearly 2,000 individuals built handcarts and walked the remainder of the way to Utah! A Historical Marker is located in the rest area between exits 230 and 237 on I-80 East. It looks to me like the Mormon settlers largely used the future route of US-6, as we visited one of their historic sites in Kirtland, Ohio and they ended in Utah, which our route also passes through. As so often happens, we have to leave town before we’ve seen every nook and cranny from 1962. If you visit and would like a different itinerary than I described, stop by Oakland Cemetery. Oakland Cemetery has been the main cemetery for Iowa City since 1843. It includes the locally famous monument, "Black Angel", a statue by Chicago artist Mario Korbel. This black, 8.5-foot tall statue was erected in 1913 as a memorial to Nicholas Feldevert. As with all bronze sculptures, it was originally a golden color. Many myths have arisen over the years to explain the monument’s change to black, even though it is simply oxidation. You might also visit the Plum Grove Historic Site. This was the home of Iowa's first Territorial Governor, Robert Lucas, and Friendly Lucas, his wife. Guided tours of the seven-room Greek Revival house are given. The home, constructed of local red brick, has been furnished by the National Society of Colonial Dames of America with pieces representative of the 1844-53 period when the Lucases lived there. I should have mentioned it yesterday, but if you are camping on your Roadtrip-’62 ™ , you could have stayed at Coralville Lake, just 4 miles north of Iowa City. The park is at the south end of the lake, near the dam constructed by the US Army Corps of Engineers. The Corps began work this dam on the Iowa River in 1949, prompted by record floods in the early 1930s. Due to delays of the Korean Conflict, the dam wasn’t finished until 1958. Besides the campground, there is boating, swimming, picnicking, hiking, and newer activities like mountain biking and disc golf. I’m here for a morning hike; see you in about an hour. A highlight of the dam area is the Devonian Fossil Gorge, but it was not there in 1962. You’re probably wondering how 375-million-year-old fossils were not here in 1962? The answer is that they were buried under dirt and gravel, and even supported a forest area. Two unprecedented floods topped the dam spillway in 2003 and 2008 and washed away tons of soil and trees, revealing a former ocean floor covered by fossils! Leaving the big city, we’re quickly back in farm country where we get stuck for a few miles behind a truck hauling hay. As usual, these trucks look amazingly overloaded. Hay has so much bulk for its weight that they can really pile it on; so much that it looks like it will fall off at any minute. We’re stuck behind because it’s piled so wide that I cannot see around the load to pass safely for several miles. Ah well, if we leave the windows open, we can enjoy the smell of fresh cut hay. In addition to hay, other crops dominate our roadside views. You might wonder why this is such productive farmland: some of the best in the world. We’re passing through the southern Iowa drift plain, which covers most of the southern half of Iowa. This is the impression most travelers get of Iowa, since most of I-80 crosses the state here. The soil here is mostly windblown loess, carried here from the erosion of other areas after the end of the Wisconsin glaciation event. This area was not under that last glacier, and so rock is not near the surface. The deep layer of loess is what holds moisture and nutrients to make this soil great for farming. We pass by the small towns of Tiffin and Oxford, Iowa next. We run about a mile north of downtown Oxford, but the earliest version of US-6 ran right through town. The next town is Homestead, Iowa, where a meteorite struck in 1875! More recently, in fact too recently to really concern us, actor Ashton Kutcher completed his high school education here, where he first developed his passion for acting. Here we meet highway US-151, which runs 337 miles through the states of Iowa and Wisconsin. The northern terminus is at Manitowoc, Wisconsin. It currently travels west with us for about two miles and then ends just 5 miles south of US-6, at the I-80 freeway. That has been the south end since 1989, but back in 1962, it ended well north of here in Cedar Rapids, Iowa. The road we see as US-151 was IA-149 at that time. We’re turning north on that road for a couple of miles to take a look at the Amana Colonies before continuing west. 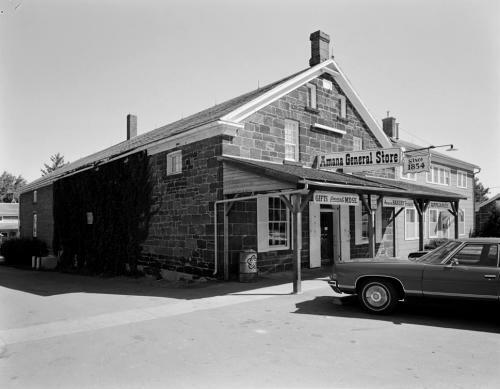 Before the country’s freeway building boom ended in the 1970s, the state planned to build a freeway right through the Colonies here, which was protested by many because it was felt that a freeway would disrupt the historic atmosphere of the Amana Colonies. 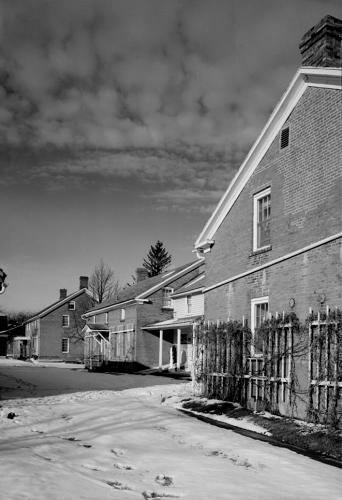 The Amana Colonies are seven villages that were founded by a German congregation known as the Community of True Inspiration. The congregates came to America looking for religious freedom in 1843-1844. Members originally settled near Buffalo, New York, where they grew to 1,200 people by 1855. They adopted a constitution that formalized a communal way of life. When they decided they needed more farmland, they came to the Iowa River where there was fertile soil, stone, wood and water at an attractive price. They established six villages named Amana, East Amana, West Amana, South Amana, High Amana and Middle Amana. Homestead was added in 1861, providing access to the railroad. The colonies maintained their communal way of life until the Great Depression, setting aside the system in 1932 when farm prices would no longer support them. The group adopted a profit-sharing corporation format to manage the farmland, the mills and the larger enterprises, and encouraged new private enterprises. By the early 1960s, the area was on its way to becoming the tourist attraction we see today: the church was declared a National Historic Landmark in 1965. I’m not sure how much was open in 1962, but today, the Amana Heritage Society maintains seven historical sites. There are exhibits in three communal era buildings and on the grounds that recall turn of the century Amana life. The Communal Kitchen & Cooper Shop Museum is the only intact kitchen remaining from the communal-era in the area. The kitchen is preserved as it was used in 1932 when it served community members for the last time. Additionally, the Amana Heritage Museum tells the full story from 18th century Germany to the present day. You can also visit the High Amana General Store, where the shelves are stocked with dry goods and merchandise reminiscent of bygone days. Other historical buildings open are a blacksmith shop and a print shop with both a hand-operated press and a Linotype machine. And of course, there are a whole host of gift shops, restaurants, and photo spots. Many of these are of recent origins, for the tourist trade. Driving to some of the other communities in the Amana Colonies, we find many antique stores. Maybe we can find something from 1962! We’ll also find lunch at one of the local restaurants. I found three old-time places without hardly searching. The Ronneburg Restaurant, Ox Yoke Inn, and Colony Inn have all been serving German and American family style meals in a country atmosphere since at least 1940. In the case of the Colony Inn, it was the first privately owned eatery in the communities after their conversion to a commercial enterprise, being founded in 1935. Continuing west from Homestead to Marengo, Iowa, after lunch, we see that US-6 sits near the high edge of the Iowa River valley. You can enjoy some good long-distance views across the farm fields from the passenger side. The first thing we see as we come to Marengo, Iowa is the Sudbury Court Motel & RV Park. It’s a very sharp looking old motel with a great neon sign out front. It’s still at the edge of town and there are cornfields across the street! Too bad we’re not staying at Marengo tonight, as the Iowa Route 6 Tourist Association directs its members there and says it has reasonable rates, clean rooms, and great hospitality. And their RV campground is a Good Sam member. While many small settlements have lost a lot of buildings over the years, downtown Ladora, Iowa looks a bit stranger than most. The building of the former Ladora Savings Bank sits all alone in its block on the north side of US-6. The remainder of the block is grass, with the only sign that anything else was ever here being the raised concrete sidewalk and steps that would have once led to stores’ entry levels. It doesn’t take long to cross through town, where I notice the hills become more noticeable west of Ladora. Victor, Iowa is another small community that we bypass by about a mile, as is Brooklyn, Iowa just ahead. The bypass was here long before 1962 though, so we wouldn’t have seen those towns then either. One notable person from Victor that we may have seen in the news in 1962 was Cleveland Indians pitcher John Dean Collum. This was his final year in the big leagues, and he had played for eight different teams between the 1951 and 1962 seasons, basically as a relief pitcher. 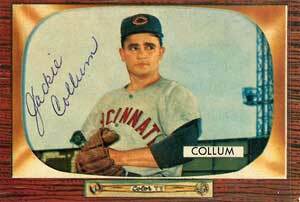 Following his baseball career, Collum worked in the automotive business in Grinnell, Iowa, just down US-6. He was also owner of Grinnell Pioneer Oil and has been inducted into the Iowa Baseball Hall of Fame. I don’t know if you noticed, but it seems like every town along the way has a Casey’s General Store gas station and convenience store. It’s not really surprising, as the Casey’s General Store chain was founded in nearby Des Moines, Iowa. Founder Don Lamberti leased an old country store type of building from his father there in 1959, and sold gas. He remodeled it into a convenience store and in 1968 his gas supplier suggested that Don buy the Square Deal Oil Company. He did so that year and opened his first Casey's General Store, in Boone, Iowa. So, while the stores we see are too new for 1962, the company and concept, and the first location in Des Moines, are not. Casey’s operates mostly in the plains states, from Illinois through Nebraska. Casey's is now the 5th largest pizza chain in the US, and the 10th largest convenience store chain! So I guess we will see these everywhere. I’m taking a slight diversion from current US-6 down an older version of the route to visit an older gas station. In downtown Brooklyn, Iowa, on old US-6, the Brooklyn Service Center has been around since well before 1962. This old gas station is still selling gas in a great looking, white brick station that still has its customer service area behind big windows. The old art deco sign on top of the building announces Standard Oil Products, but today the pumps are unbranded. Looks like they do most of their business selling and installing tires, so the gas sales may disappear at any time. And, there’s a Casey’s located kitty corner, so I’m sure Brooklyn Service Center doesn’t compete on gas, pop and snacks. Service must be what keeps them here. Today, the highlight of a drive through Brooklyn is its “Avenue of Flags”. This is a permanent lighted display of flags from all 50 states, the Armed Services, and some special interests. The flags surround a gigantic US flag. These are impressive, but clearly a recent installation. Back on current US-6, we next cross route US-63. This highway travels 1,286-miles and has its southern terminus at I-20 in Ruston, Louisiana. The northern terminus is at US-2 in Benoit, Wisconsin. Between these, US-63 runs through the scenic Mark Twain National Forest. If it crossed Louisiana, it would be a full cross-country highway north to south, but this extension to coastal Louisiana was denied in 1940 by AASHTO, the body that governs the US-numbered routes. In 1962 it ended at Turrell, Arkansas, north of Memphis. The south end was extended to Ruston in 1999. Here in Iowa, it joins US-6 westbound for two miles near Grinnell, Iowa. At Grinnell, let’s stop at the Grinnell Historical Museum. The museum has been around in some form since before 1954, so we could have stopped in in 1962. They began in some rooms over a Candyland store, but that building was destroyed by fire. In 1958, the Grinnell Historical Museum Society was formally incorporated and received a major gift. This allowed them to acquire their current museum in 1965, the late-Victorian, 10-room, McMurray House. Among many other items, they have a collection of typewriters. While many are old, many others look like what we would have seen in offices of the late 1950s or early 1960s. Afterwards, what better way to explore Grinnell than on your own two feet? You can pick up a route map for a self-guided walking tour. One building you do not want to miss is the Merchants National Bank building. The building is one of the eight Midwestern "jewel-box" banks designed by Louis Sullivan, a prominent American architect at the turn of the 20th century who designed many buildings in the Chicago area. The bank was constructed in 1914 and remained a bank until 1999. In 1962, it was Poweshiek County National Bank. It now houses the Grinnell Area Chamber of Commerce and Grinnell Visitor Center, so we can look around the interior. The magnificent ornamentation includes the unusual terra cotta entrance portal, stained glass windows, a glass mosaic by Lewis Millet around the clock, and pink Tennessee marble floors. 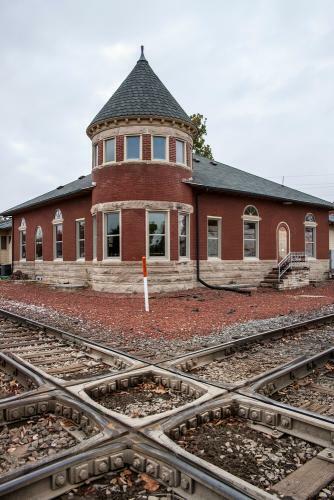 Another impressive local building is the Rock Island Depot. The tower is what makes this little stone and red-brick building interesting. The station was constructed in 1893 and originally contained two waiting rooms, a baggage room, lunch counter, and offices. Passenger service continued to Grinnell until 1970, and then the building went unused until restored in 1993. It’s now the Peppertree at the Depot Crossing Restaurant. Other buildings on the half-mile walking tour are several homes of the Prairie School of Architecture, the Strand The-atre, and several commercial buildings. A building I won’t be stopping at is the Iowa Transportation Museum, as the museum dates only from 1999. Grinnell is also home to Grinnell College, a private liberal arts college established in 1846. In 1889, Grinnell College and the University of Iowa played each other here in the first football game played west of the Mississippi River. If this were 1962, we could grab a nice root beer float at the A&W Restaurant as we leave town. The restaurant opened in 1955 and the building is now the West Side Family Restaurant. It changed hands and names in 1979. It’s a rather plain looking building now that doesn’t retain any identifiable features from its A&W days. But they use real Bleu Cheese from the Maytag Dairy up ahead in Newton, Iowa. The depot we saw reminded me that we’ve been criss-crossing the railroad ever since we left Iowa City. Sometimes it’s on our right side, sometimes on our left, sometimes a few miles away in the small towns we bypassed. We’ve crossed it at grade and on overpasses and will even go under it in Newton. This rail line is the Rock Island line, which began life as the Mississippi and Missouri Railroad (M&M Railroad). It was the first railroad in Iowa; chartered in 1853 to build a line between Davenport on the Mississippi River and Council Bluffs, Iowa, on the Missouri River. The Chicago and Rock Island Railroad had completed the first bridge to cross the Mississippi River in 1856 and promptly bought the M&M to continue west. The line was completed to Council Bluffs in 1869 as the Chicago, Rock Island and Pacific Railroad, a name it retained until being dissolved in bankruptcy in the 1970s. The day after it reached Council Bluffs, the Union Pacific and Central Pacific completed their line to the West Coast and transcontinental railroading was born. Considering the history of the Rock Island’s financial problems in the 1960s and 1970s, it’s a wonder the track is still here and even more surprising that it is still in operation. The Chicago, Rock Island and Pacific Railroad managed reasonably through the 1950s and early 1960s, even though it was surrounded by larger railroads with faster lines. However, their last year of profitability was 1964, after which it limped along until it filed for bankruptcy in 1975. It operated under bankruptcy for several years, but the Rock Island ceased operations on March 31, 1980. At over 7,000 miles of track, it was the largest railroad ever to be abandoned. It was completely liquidated and many miles of rail were pulled up and sold for scrap. The Chicago-Omaha main line that we have been driving beside is now owned and operated by the Iowa Interstate Railroad. Back in 1962, we could have seen passengers at all the stations along our route, as the Golden State was run until 1968, including dining and sleeping cars up to the end. They also ran The Cornhusker on this main line until 1970, as the Rock Island did not join Amtrak when it began in May of 1971. Today’s only passenger service in Iowa is via Amtrak from Burlington, Iowa to Omaha, Nebraska, through the southern tiers of counties. The famous song about the railroad was written in 1929 and first performed by a singing group composed of employees of the railroad at its Biddle Shops freight yard in Little Rock, Arkansas. The first recording of the song was made by John A. Lomax at the state prison in Tucker, Arkansas in 1934. While the song is about a different branch of the Rock Island, it’s a great railroad song of our era so let’s listen to Johnny Cash performing “The Rock Island Line” from his album “Johnny Cash with His Hot and Blue Guitar”. This was recorded in 1957, so it’s probably the version we would have heard in 1962. Just before we reach Kellogg, Iowa, a sign notes that Rock Creek State Park is just a few miles off US-6. The park was dedicated in 1952 and offers boating, picnic grounds, swimming, camping, and hiking and horse riding trails. The lake has 15 miles of shoreline, which affords anglers plenty of opportunities for catching bass, crappie, bluegill, catfish, saugeye and bullhead. You can even ice fish in the winter, as the lake commonly freeze over. The Iowa Department of Natural Resources maintains a game management area open to public hunting here and ducks are a favored game. Thousands of teal, bluebills, and mallards migrating to their summer breeding grounds stop at Rock Creek. Time for another hike for me! When arriving at Newton, Iowa, one of the first places we see is the Mid-Iowa Motel. This is one of those small throwbacks to the 1950s that hasn’t been updated a lot since then. Some rooms have the original knotty pine paneling. It’s under new ownership as of late 2012: changes may be coming. Nearby is Nelson Manor, a nursing home that looks like it was also once a motel. Similarly to the part of Illinois we drove through, in the late 19th century, Newton's growth was fueled by the development of coal mines in the region until the early 20th century, when large-scale mining in the Newton area had declined so that only a few mines were worked intermittently. Newton has been home to cigar factories, patent medicines and ant poison manufacturing, advertising specialty companies, and farm equipment manufacturing. But its biggest industry became home appliance manufacturing because it was home of the Maytag Corporation from 1893 to 2006. In 1893, Frederick Maytag formed the Maytag Washing Machine Company and grew even through the Great Depression of the 1930s, when the company was one of very few to make a profit in several successive years. The Depression years were not without problems though, as workers struck in 1938 over a 10% pay cut. Maytag beat the strikers using other workers only through intervention of four Iowa National Guard companies. As with many businesses, after World War II Maytag grew as consumer spending skyrocketed. Maytag was much smaller than companies like Whirlpool, General Electric, and Frigidaire, so it limited production to just washing machines and dryers, instead of a full line of household appliances. The company did sell refrigerators and stoves manufactured by others under the Maytag label, but stopped that in 1960. The commercial coin-slide washers used in laundromats were introduced in 1958, opening a market for self-service laundries and commercial laundries. Though a smaller company, Maytag continued to grow and 1961 saw completion of Maytag's new corporate headquarters building in Newton. The next year, Frederick Louis Maytag II, the last Maytag family member to run the company, died. Manufacturing was begun in other factories, as the company finally expanded into other kitchen appliances with its own design of dishwashers and waste disposers. In 2001, Maytag cut the labor force at the Newton plant and moved more production to newer Maytag plants in Mexico, signaling the beginning of the end. Layoffs continued at the Newton plant through 2005 and the next year the company was acquired by Whirlpool. This consolidation led to the complete closure of Maytag plant and headquarters here in 2007, leaving about 1,900 people unemployed. There is still one Maytag-owned business in Newton which was not connected to the appliance company. Maytag Dairy Farms was formed in 1919 by Elmer Henry Maytag, son of the Maytag Corporation founder, and is currently owned by eleven members of the Maytag family. They produce cheeses, and are especially known for their blue cheese that is aged in caves on the farm. They’ve been making it here since 1941, so we could have bought it in 1962. Of course the Jasper County Historical Museum has more information on the Maytag Corporation in addition to other local history. The Maytag collection is particularly complete because the Maytag Company dismantled their historic downtown center in 1980 and donated the contents to the museum. It’s adjacent to a "Washing Machine Center of the World" exhibit that also features washing machines built by other Newton Companies. The exhibit includes the last wringer washer made (from 1983) and the last Maytag made in Newton. Though the museum itself is too new for us, as it was only opened in 1979 in a brand new building, many of the Maytag displays could have been seen in 1962 at the company’s downtown center. A drive around downtown is enjoyable because of the outdoor murals, many painted by Carl Homstad around 2005. The first one that caught my eye while driving around town was his Newton Printshop, which he painted on a newspaper building. There’s also some nice old architecture, such as the Jasper County Courthouse. The courthouse was built of limestone in a Beaux-arts design, with a clock tower like we have seen all along US-6. It was dedicated in 1911 and designed by Proudfoot & Bird, a firm that designed many public buildings in Iowa which are now on the National Register of Historic Places, as is this one. The courthouse sits on a large green surrounded by commercial buildings, including the historic Capitol Theatre. The Capitol is located in the Hotel Maytag Building on First Street. It originally opened in 1927 as a vaudeville theater, was converted to a single-screen theatre, and now has two screens still showing first-run films. It was converted to digital projection in 2014. Just so you know, I was not driving around aimlessly: I was looking for dinner. I located several old-time restaurant candidates in Newton. There is a Dairy Queen downtown on a very tiny lot that looks like it could have been a Dairy Queen back in 1962. The Snook Inn Sandwich Shop opened in Newton in 1939 but closed in the summer of 2011, so that’s no longer a choice. The building is still there, along with the signature sign. The Midtown Café is in the Hotel Maytag Building next to the theatre. They project a hometown atmosphere with lace curtains and walls covered in Americana decorations like posters, flags, painted stars, and old photos of Newton. The Midtown’s specialty is the Big Happy Burger, featuring onions, green peppers and bacon inside the burger, with ham, mozzarella cheese and pineapple on top! But I’m stopping at the old Maid-Rite Sandwich Shop because they feature a type of hamburger I remember as a kid but haven’t seen in a long time. Though the sign out front still says "Maid-Rite", the official name of the place is now Mr. Dan's Sandwich Shop. The Maid-Rite Hamburg is a chain of restaurants first opened in Muscatine, Iowa in 1925 by Fred Angell. Newton was the location of Fred’s second restaurant, opened the next year. The Angell family sold the Maid-Rite company in 1982 and it’s corporate headquarters are in Des Moines, Iowa. This was when the Newton restaurant ceased being an official Maid-Rite franchisee. Though the chain is famous for its seasoned ground beef, the Newton location has never used the corporate seasoning, as it was grandfathered in. 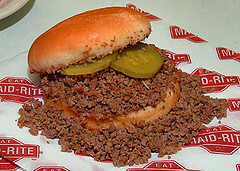 The hamburger is actually loose ground beef piled onto a bun and has just salt for seasoning. Some have described the sandwich as, “…a sloppy joe without the sloppy.” A spoon is provided to pick up the meat that falls onto the wrapper. The building has been through a few changes. A back room and a drive-up window were added in the early 1970s, but the main part is still the same as reconstructed in 1962. I remember similar sandwiches from a restaurant in Saginaw, Michigan called Doyle’s. As a kid, it was always a treat to get one of their “scrambled hamburgers” with my dad. Doyle’s no longer exists back home, but I’m betting this is every bit as good. Last site to see in Newton, or actually as we leave Newton, is the Valle Drive-In. The Valle sits surrounded by cornfields as it’s still too far from town for development to have reached it. While it would be fun to stay the night in Newton just to see a movie at one of only four drive-ins left in Iowa, I really need to put more miles on today. Besides being rare, the Valle is also old, having opened in 1949. In fact, it’s oldest operating drive-in in the state. Those speakers that you see are the speakers used in 1949, though you can listen on either FM or AM radio if you prefer. Of course the Valle Drive-In has a concession stand where you can get your traditional movie foods, buy they also allow you to bring your own food in. I wonder how they make any money? Already back in 1962, US-6 left its old route and joined the I-80 freeway about 4 miles before reaching Colfax, Iowa. It then bypassed Des Moines, Iowa completely, finally leaving I-80 at the southwest corner of town. Of course we’ll stay on the old road because that’s where all the sights and motorist services were. But in just a few years, motels, gas stations, shopping and restaurants began popping up along the freeway. The name of Colfax reminds us once again of the coal mining history of the area; even much of the greater City of Des Moines area was mined. But Iowa coal tends to be too high in sulfur for modern applications, and the last commercial mine closed in 1994. In the late 1800s, thousands of people visited Colfax to partake of the healing powers of the fourteen mineral springs here. With the Great Depression, the city's mineral springs industry declined and died out. However, the 1965 Rand McNally Atlas still has a label “Mineral Springs” at Colfax, so maybe there was some vestige in 1962. Could you still buy bottled mineral water? Colfax was also the home of James Norman Hall, an American author best known for the novel “Mutiny on the Bounty” (with co-author Charles Nordhoff). The novel was published in 1932 and had been written while Hall and Nordhoff were living on the island of Tahiti. It was first turned into a movie in 1935, and again in 1962, when it starred Marlon Brando and Trevor Howard. The HMS Bounty reproduction ship built for the movie used to be docked near the beginning of our US-6 route, in Fall River, Massachusetts. That’s just how amazingly historic US-6 can be! Polk County's first settler of European descent, in 1844, is still remembered in the name of the town of Mitchellville. We continue to Altoona, Iowa, where you can now see that we’ve entered the Des Moines, Iowa metropolitan area. The east edge of town is all new buildings and a new 5-lane pavement. A new Dairy Queen and Hy-Vee supermarket, new apartments and houses, and new shopping plazas line the highway. Here we meet highway US-65, which runs 969 miles from Albert Lea, Minnesota to Clayton, Louisiana. Back in 1962, it was 1518 miles long, from from St. Paul, Minnesota to Vidalia, Louisiana. In 1980, it was shortened in Minnesota and in Louisiana, though in 2005 some mileage was added back at the south end. The old road of US-6 traveled along with US-65 into Des Moines’ suburbs back in 1962, so that’s the route we will take. We won’t be seeing the most famous attraction in Altoona because it’s too new for us. Adventureland Amusement Park opened in 1974 on the model of the successful theme parks of the early 1960s, such as Disneyland and the revamped Cedar Point. Today, it’s Iowa's largest tourist attraction, with over 100 rides, shows, attractions, and a waterpark. In 1962, we would have seen just farms here. There will be a lot of sights to see around Des Moines, so we’ll spend all day tomorrow here. For now, it’s late and I’m going to stop at a motel and find dinner. There are several older motels near the interchange with US-65, probably because we are so close to Adventureland, but that probably means they date from the opening of the park and are too new for us. One that was much older was the Archer Motel, which originally was part of a country club that appears to have been around since 1910. But it was torn down in late 2013 to make way for a Kum & Go. convenience store. It used to the very cool sign seen in Nels Olson’s photo above. Instead, I’m opting for elegance tonight, and staying downtown at the Hotel Fort Des Moines. Known as "Iowa's Landmark Hotel", the Fort Des Moines has hosted presidential candidates, movie stars, and more since opening in 1919. Proudfoot, Bird & Rawson, the Des Moines architectural firm which also designed the Jasper County Courthouse we saw today, designed the building. Unlike many midtown hotels, the Fort Des Moines has been renovated several times over the years, including once in the 1950s. We would have seen a fairly updated facility in 1962 and today we see a hotel that was fully restored to its original appearance in the 1980s. With the lodging for the night out of the way, let’s look for dinner. I have to drive all the way across town to the west side to find it, but I’m eating at George the Chili King tonight. The current location just is visible from US-6 and is actually their third location. It’s run by a second generation of the Karaidos family. The original was downtown and closed in 1946, when it moved. This location opened in 1952 and still retains its classic ambiance, with hand-painted menu boards like I remember as a kid, carhop service instead of a drive-thru, stool seating, and service on waxed parchment paper instead of plates. The menu also classic, with just a few burgers, the typical sides like onion rings and chili cheese fries, coney dogs, and some specialty sandwiches like pork tenderloin, chicken, fish, and the Fat Man Special. Homemade shakes and of course chili round out the menu. I just have to try the chili cheese fries and onion rings as those are my favorites if they’re done right. And they must be done right, because George’s just finished filming for Diners, Drive-Ins and Dives on the Food Network! Afterwards, I’m retiring to watch some television tonight. Des Moines is home to the Meredith Corporation, a media company that owns magazines and television stations. Meredith Corporation was founded here in 1902, when Edwin Thomas Meredith began publishing Successful Farming magazine. 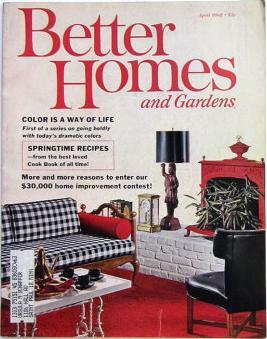 He expanded to other magazines and was very successful with Better Homes and Gardens, which began in 1924. The company got into television early, buying a New York station in 1948, WOW in 1951, and others in 1952 and 1953. Today, Meredith has stations all around the country and also publishes Ladies' Home Journal magazine, Family Circle, Parents, and many specialty magazines. Strangely, they have never owned a TV station in their hometown. The closest I could find was their ownership of WOW in Omaha, Nebraska from 1951 to 1975, and you probably couldn’t even get that signal here. In 1962, we would have watched Des Moines stations WHO on channel 8 or KCCI on channel 13. I’ll see you tomorrow when Roadtrip-’62 ™ looks around Des Moines. Wonder what’s on tonight?